The “Piazza Grande” for men is inspired by the bestselling “Piazza”, which was introduced when the first Swarovski watch collection was launched at Baselworld 2009. Incorporating urban forms influenced by contemporary architecture, the “Piazza Grande” Quartz Rose Gold line will attract men looking for modern elegance, both refined and masculine, while combining the precision and quality of Swiss watch-making. This distinctive watch, with its large 42 mm diameter, exemplifies purity of line. Within the classic ring of the watch dial, the rose-gold hand-applied Swarovski Swan Logo mark takes its place at the top of the dial. Each hour marker carries more than one crystal, except at 12 o’clock. Perfectly circular, the black dial bears faceted hands that count each hour, minute, and second. On its right side, the hand-polished rose-gold PVD cylindrical case is adorned with decorative elements in scratch-resistant black ceramic, which is faceted using true Swarovski expertise. The crown is also created in ceramic and features 24 facets, a real feat of technical prowess when working with such a material. The attention to detail of this timeless new creation, with its unequivocal horological design, extends to the back of the rose-gold PVD case with the Swan Logo mark. For a sportier, casual look, one could opt for the brushed and polished stainless steel bracelet which naturally extends from the faceted lugs. The bracelet features a push-button clasp. 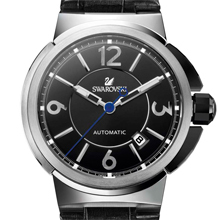 Alongside the nine other styles, the dial is also offered in elegant navy blue, chic black, or white. The complementing strap is available in genuine leather of various colors, complete with a crocodile embossed structure, or a polished and brushed stainless steel bracelet. Faithful to the maxim by company founder Daniel Swarovski, “always improve that which is already good”, Swarovski pushes the limits of perfection by integrating a mechanical Swiss watch movement with automatic winding into six of the “Piazza Grande” models. An outstanding timepiece, this automatic model features a 43 mm stainless steel case to protect its precious movement. Rounded and refined, this piece once again allows us to truly appreciate the sobriety of the design. 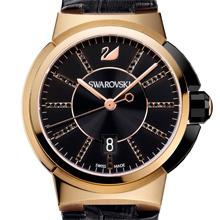 Its black dial, with sunray-patterned center and opaline edging, serves to highlight the Arabic numerals. A striking satin polished finish is applied by hand at 3, 6, 9 and 12 o’clock, alternating with polished and faceted index markers. The date indicator is placed at 4.30. The highly technical half-skeleton hour and minute hands are luminescent, making the watch perfectly legible during both the day and night. The slender second hand is magnificent in electric blue. Particular attention has been paid to the two decorative elements and crown situated at 3 o’clock on the stainless steel case. Encased in scratch-resistant, faceted black ceramic each of these elements is a true example of Swarovski’s technical prowess. Their unique design conveys an avant-garde style combining timeless classicism and modernity. For those intrigued by the movement, the back of the case is a scratch-resistant sapphire watch glass that allows you to admire the mechanical movement with its automatic winding, and in particular the rotor featuring a “Côtes de Genève” decoration. Mounted on a polished and brushed stainless steel bracelet featuring an elegant double push button clasp, the automatic “Piazza Grande” watch is contemporary, sporty and 100 meters water resistant. This luxurious range is completed by alternative versions with dials in navy blue or silver, and contrasting sunray patterns with a matt finish. Some models feature hand-applied clear crystals, while others feature black or navy Arabic numerals which compliment the black or white dials. Completed by the precision and quality of the Swiss movement this watch once again displays the expertise and quality of Swarovski. 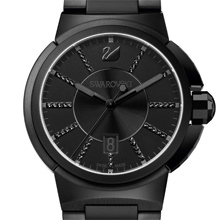 Black dial, with Jet Hematite crystals applied to all index markers other than at 12 o’clock. Swan logo mark in rose-gold is placed at 12 o’clock. Date indicator at 6 o’clock. Swan logo mark impression on the back of the case. Dial center is sunray-patterned while the surrounding outer dial is matt black featuring satin-polished Arabic numerals and rhodium-plated, faceted index markers, applied by hand. Date indicator at 4.30. Mechanical automatic winding, Swiss made. Rotor features “Côtes de Genève” decoration and Swarovski name engraved in black. Case back features a scratch-resistant sapphire crystal glass. Crown in black ceramic adorned with Swarovski logo mark.